When Rene De Veaux’s parents die he goes to live with his uncle, who happens to be setting out on an exploration of the new world. Source: Munroe, K. (1887). The Flamingo Feather. New York: Grosset & Dunlap. Chapter I: "Réné de Veaux"
Chapter II: "A Wonderful Deliverance"
The Indian tribe prepares for a great festival where a young man will be chosen as the bow-bearer. Chitta enacts his revenge against the tribe, causing problems for the Indians and the Frenchmen alike. Chapter IV: "Has-se is Held Prisoner"
The soldiers capture Has-se for questioning. He and Rene discuss what has happened, what may happen, and what needs to be done. Chapter V: "The Escape of Has-se and Rene"
Rene decides to make the journey with his friend. He is concerned about whether he can escape the fort undetected. The boys journey by canoe. Concerns are raised when they find evidence of others pursuing the tribe, evidence that leads them to fear there are enemies nearby. Chapter VII: "Chitta Becomes a Seminole"
The story turns to Chitta, revealing his actions and travels after the burning of the storehouse. Chapter VIII: "On the Trail"
The two groups both set out to follow the tribe. Each is aware there are others there, but neither knows what to expect from the other. Chapter IX: "A Trap Avoided and Friends Discovered"
Has-se deals quickly with the venom of the moccasin. They boys learn that their friends are near, but they must first escape their enemies. Chapter X: "Mutiny at Fort Caroline"
This chapter focuses on the events at Fort Caroline. The men are getting sicker, there is a mistaken “attack” on an Indian camp, and the soldiers mutiny. Rene recovers. He makes his request to the Alachuas. On the way to Fort Caroline there is news of the attack. Chapter XII: "Abandoning the Fort"
Has-se shares the secret of the fort with Rene. The provisions are traded. The men make ready to return to France. Chapter XIII: "Arrival of Jean Ribault"
The men are interrupted in their departure by the arrival of ships. Later even more ships arrive, with good news. Unfortunately there is also the arrival of bad news, as the Spanish ships are not far behind. Chapter XIV: "A Night of Terror"
The weather changes Ribault’s plans. Menendez takes advantage of a land route. Rene saves others, but isn't safe himself. Chapter XV: "Rene in the Hands of His Enemies"
Rene manages to befriend one of his captors, but fears that all hope is lost. The tribe prepares for feasting and torture. Chapter XVI: "Has-se Receives the Token"
Has-se recieves the token and sets out to rescue his friend. E-chee, Has-se and Yah-chi-la-ne enter the Seminole camp. Chapter XVII: "Death of Has-se (The Sunbeam)"
Has-se is killed, but not before asking Rene to take his place in the tribe. Chitta appears again. Chapter XVIII: "The French Have Come Again"
The French return and Rene determines to leave the new world for home. He asks his tribe for help and promises to return. He learns much from the French, including news of his uncle. Chapter XIX: "The Old World Once More"
Before departing, the group makes a profitable discovery. Rene and his uncle are reunited. Munroe, Kirk. The Flamingo Feather. Lit2Go Edition. 1887. Web. <https://etc.usf.edu/lit2go/78/the-flamingo-feather/>. April 20, 2019. 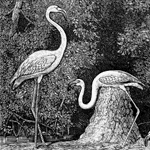 Kirk Munroe, The Flamingo Feather, Li2Go edition, (1887), accessed April 20, 2019, https://etc.usf.edu/lit2go/78/the-flamingo-feather/.